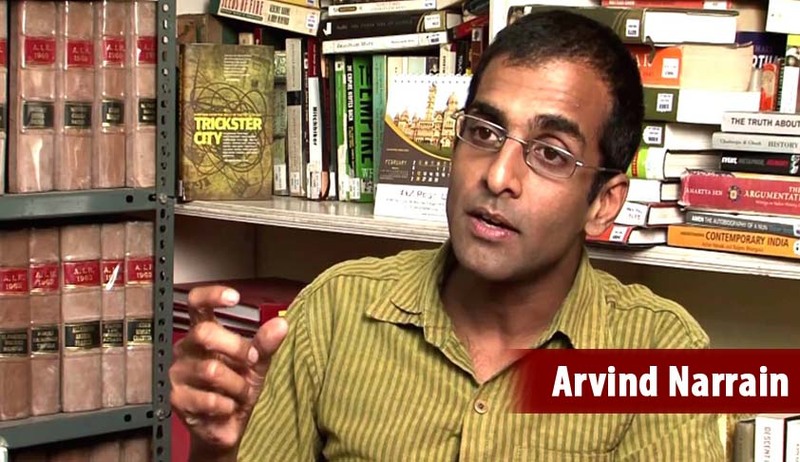 Arvind Narrain, is a well-known activist and legal scholar championing the rights of the marginalised and discriminated through effective legal campaigns. He is a founding member of the Alternative Law Forum in Bangalore, an NGO, which aims to integrate alternative lawyering with critical research, alternative dispute resolution, pedagogic interventions and maintaining sustained legal interventions in various social issues. Arvind Narrain has worked on human rights issues including mass crimes, communal conflict, LGBT rights and human rights history. But it is on the LGBT issues, that he has been an outspoken advocate, articulating their rights and concerns far more effectively, both in judicial forums and in civil society. His contribution to the success of the Naz Foundation’s petition in the Delhi high court, and in the ongoing curative case in the Supreme Court against the Kaushal decision is phenomenal. The Allied Rainbow Communities International (ARC)’s (where he is the Director for its Geneva office) website mentions that Arvind’s association with advocacy at the international level has involved significant collaborative work at the Human Rights Council and he has seen first-hand, how international and domestic advocacy can be mutually reinforcing, and how international instruments like the Yogyakarta Principles have a role to play in domestic litigation. The Yogyakarta Principles were developed and unanimously adopted by a distinguished group of human rights experts, from diverse regions and backgrounds, including judges, academics, a former UN High Commissioner for Human Rights, UN Special Procedures, members of treaty bodies, NGOs and others. These Principles are an invaluable tool for activists working on sexual orientation and gender identity issues, and affirm binding international legal standards with which all States must comply. Q. India’s abstention from voting on the UNHRC’s resolution to appoint an independent expert on SOGI (Sexual Orientation and Gender Identity) has disappointed those who expected India to support LGBT rights. How do you explain India’s decision? A. India’s abstention seems to go hand in hand with the way the Indian government has responded to Section 377 domestically, namely, India on the face of it, will take no decision. However this neutrality is superficial as sometimes taking no position can perpetuate the status quo. If the mandate of the Independent Expert is to in effect to shed light on violence and discrimination on grounds of sexual orientation and gender identity, by abstaining, India is saying that for India it is not an issue. Imagine India abstaining on a resolution on racism for example, it is unthinkable. Further, one should note that India voted for many of the amendments which sought to introduce notions of respecting cultural particularity into the preambular paragraphs. Thus India’ neutrality was actually weighed in favour of efforts at diluting the mandate by voting for some of the amendments. Q. India’s abstention has coincided with five celebrities petitioning the Supreme Court to consider their prayer for striking down Section 377 IPC separately from the pending curative petition before it. Were they justified in their prayer on the ground that they were the victims of discrimination? Does it make sense to hear this petition along with the curative one? A. I think the petition, rather than calling it a celebrity petition, is better described as one by five LBGT citizens of India whose quality of life is impeded by Section 377. Section 377 has an impact not just in terms of cases filed against LGBT persons but in terms of the fear it induces of prosecution, the actual persecutions and the harm it inflicts on the dignity of the LGBT person. Thus the petitioners are justified in the case they are putting forth. It should also be noted that the impact of Section 377 is across social class and in fact LGBT people at the very bottom of the socio-economic strata not only encounter a dignitarian harm but also likely to experience police violence, flowing from Section 377 on a regular basis. One hopes that this petition is also tagged along with the other petitions when the matter is finally heard by the Supreme Court. Q. The curative petition has been referred to a five- Judge bench, which is yet to be constituted. There has been speculation about the composition of this bench. Should this include the three senior-most Judges of the Supreme Court? A. The composition of the Bench is at the discretion of the Chief Justice. There is no requirement unlike the curative petition that it should include the three senior most judges. Q. The Supreme Court has rebuffed the Centre’s bid to seek clarifications on the transgender judgment saying it does not apply to lesbians, gays, and bisexuals. How do you explain the Centre’s confusion on this question? What would the Supreme Court’s oral clarification mean as far as the NALSA judgment? Some have suggested that the clarification is a setback to LGBs. A. My understanding is that the Supreme Court stated that there is no need for clarification as there is no confusion in the judgment. The judgment is very clear that it applies to transgender persons. The clarification petition, apart from asking if gays and lesbian come within the meaning of transgender, also questioned whether the decision on whether transgenders are a backward class should be decided by the National Commission for the Backward Classes (NCBC) and not the Court. The clarification petition only betrays the homophobic mindset of the current administration and its sheer fear that it could be perceived as supporting gay and lesbian equality. The petition, by delaying the implementation of the judgment and implicitly questioning the rationale of reservation, has shown that it is no friend of the transgender community either. This is no set back at all, because the Court has not diluted the NALSA judgment, but merely stated the obvious. Q. The Government did not press its other query on the 2014 judgment on whether the transgender must be included in the SEBC category, to grant them the benefits of OBC reservation. The Government's argument is that only the NCBC can declare a group as SEBC, so as to extend the benefits of reservation, and that some transgenders may indeed be SCs or STs by birth. As the Government did not press this question, can we say it is only those transgender, who are not OBCs or SCs/STs by birth, may be granted the OBC status in terms of the NALSA judgment? A. Perhaps we need a deeper understanding of how reservation can work before this question can be answered. The principle of reservation is to include those who were formerly excluded. By itself, is it enough? Do we also have to import the principle of reasonable accommodation from disability law to ensure that reservation does not become an empty slogan. Q. Can the reservation for transgenders move beyond mere reservation to affirmative action ( education, training etc )to ensure that it is not just a platitude? A. The central government needs to pass the Rights of Transgender Persons Bill as well as have a transgender policy in which reservation is a part of a wider gamut of actions designed to ensure inclusion. Thus reservation cannot be a standalone action, a zero sum game where we decide under which category a transgender Dalit person fits, but rather should encompass a series of policy actions. For this we need a transgender policy which can answer the question you are raising in a principled fashion so that nobody is left out. Q. Can you reflect on your own work all these years - with the ALF, and now with the ARC? What have been the accomplishments and the challenges ahead? A. The fifteen years with ALF were formative years as I learnt a lot, having the privilege of working with some of the most brilliant and passionate colleagues I could have asked for. The great strength of ALF was that working in ALF one got a sense of the challenges in a range of human rights issues right from communal conflict, socio economic rights to civil and political rights to LGBT rights. As such you could not have asked for a better schooling in human rights in its broadest dimension. Currently, my work takes on the dimension of trying to look at the LGBT issue from an international lens, appreciating what the challenges at that level are and how one can move the system in a more global sense to include LGBT concerns. Q. How does one take forward the struggle in contexts as diverse as Egypt, Tonga and Indonesia? How can human rights law, based as it is on the principle of universality, aid LGBT struggles in far flung parts of the world? A. My effort, again based as it is on the ALF experience, is to see the LGBT struggle as part of a wider continuum of human rights struggle and work towards developing a legal regime which can respond to human rights violations of LGBT people.